NBC10 is one of 19 news organizations producing BROKE in Philly, a collaborative reporting project on solutions to poverty and the city’s push towards economic justice. Follow us at @BrokeInPhilly. 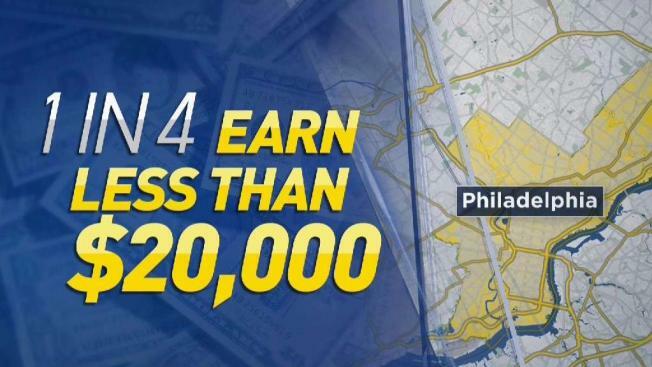 Philadelphia is the poorest large city in America. For the past decade, Philadelphia has been unable to shake its notorious distinction despite population and job growth. More than a quarter of the city’s residents live in poverty, meaning a family of four earns less than $25,100 per year, according to the 2018 State of the City report. Forty percent of those are struggling to break out of deep poverty, with half that income. These statistics are not new. This has been Philadelphia’s economic reality for so long that the data tends to provoke numbness in place of anguish. 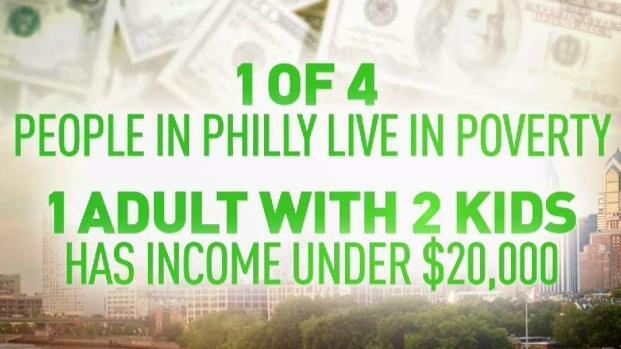 Philadelphia is America's poorest big city; one quarter of its residents live in poverty. NBC10 is highlighting the situation in the collaborative reporting project "BROKE in Philly." But the frightening truth is that these numbers aren’t the full extent of our problem. The federal poverty line — which dictates official poverty rates—is based on a 1963 algorithm, adjusted yearly for inflation. Over the last 55 years across the United States, this line has dropped so far below cost of living that many economists now use an alternative baseline, set at approximately twice the federal line. Below that, it’s virtually impossible to make ends meet without external assistance. What this means for Philadelphia is staggering: according to calculations by the local research and analysis group the Economy League, 48 percent of the city’s residents — almost half of us — cannot provide basic subsistence for our families. This reflects a societal failure of epidemic proportions. For those of you still feeling numb, think of two Philadelphians you love. Imagine that one of them will no longer be able to put food on the table while also making rent. They face mountains of debt, possibly choosing between school supplies or medical care. Now, a critical mass of the city’s general interest, ethnic and community newsrooms have come together to say "enough." This group has been reporting on poverty for years, but NBC10 and Telemundo62, along with 18 other local news organizations, have decided to take a more direct, and collective, approach. We are launching BROKE in Philly / Sin Dinero en Filadelfia, an ambitious, year-long initiative that will provide in-depth, nuanced and solutions-oriented reporting on the issues of poverty and the push for economic justice in Philadelphia. This is not the first time NBC10 has explored solutions to some of the city's most complicated problems. Last year, we reported on suicide prevention through our groundbreaking series Preventing Suicide: Breaking the Silence. The year before that, we dove into the opioid crisis through Generation Addicted. We also investigated child exploitation in Protecting Innocence and housing insecurity in Faces of Homeless Youth. Like those initiatives, BROKE will take a clear, hard look at what works to help ensure greater economic security for residents of our region, and what doesn’t. We aim to explore poverty’s complex causes and highlight creative approaches that show promise in its alleviation. We will ask questions such as: What’s working in Philly to alleviate poverty and further economic security for all? What has been tried and failed — and what can we learn from that? How are other cities increasing economic equity and what are some lessons for Philadelphia? Our reporting aims to, piece by piece, examine what it would take to bring about economic justice in Philadelphia, which we broadly define as our city being a place in which a greater number of people are economically secure and thriving. The best solutions reporting comes from a solid understanding of the roots of a problem. As a start, we have created a graphic breaking down the major factors that have led to Philadelphia being the poorest big city in America. We also aim to be helpful and have compiled an interactive map to locate resources that are critical for those struggling the most. 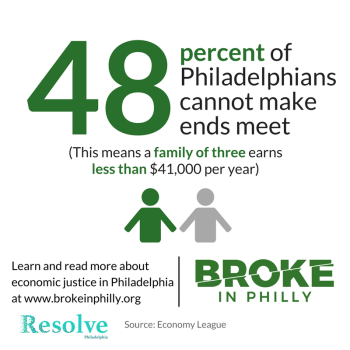 BROKE is led by Resolve Philadelphia, a reporting project that also includes Philadelphia Media Network, WHYY, The Philadelphia Tribune, El Zol, Philatinos Radio and WURD, among other organizations. Resolve is supported by the Lenfest Institute, Klein College of Media and Communications at Temple, the Wyncote Foundation and the Solutions Journalism Network. In December, we asked for your input to decide our 2018 topic — receiving hundreds of responses, suggesting more than 30 lines of inquiry. From these, we picked the one where it seemed like we could have the most impact. We hope you’ll continue to help us craft the project. What should we report on? What questions do you have about our city’s economic reality? What else can we as media do to change how we understand and talk about these issues? Drop us a line here or text us at 215-772-3212. Philadelphia could be unique in how we deal with this challenge. Many other large cities have seen targeted displacement and rising costs of living push those with the lowest incomes out to the suburbs. They got rid of their large-scale poverty problem without fixing it. Is that us? We are Philadelphia: a city of underdogs that make miracles happen. If we can’t use our ingenuity to tackle our biggest collective problem, we’re not living up to our name. Let’s do this, Philly. Let’s win this one.